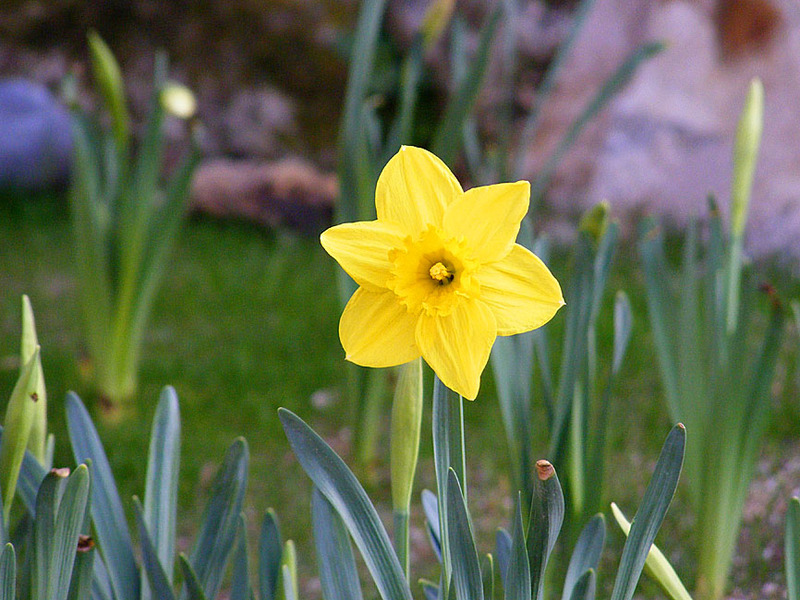 This is our first daffodil for the year, actually from 29 March. They are a bit later than some because they don't get much sun in the back garden at this time of year, but isn't it handsome? 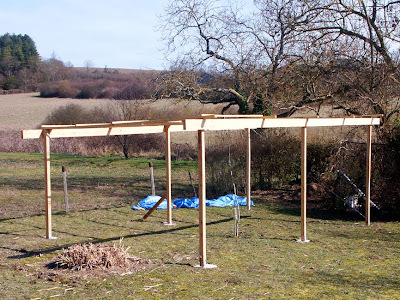 Yesterday Stéphane and Simon started work on the frame for the insulation and plasterboard. Simon will write more about it when he isn't quite so tired, but it is looking good so far. What sort of blog about France would this be if we didn't include the occasional post about snails? The French do eat snails, and we periodically catch some old lady collecting her supper by torchlight under the château ramparts. Sea snails are also popular, and frankly, tastier in their own right (as opposed to being something for your garlic butter to stick to). 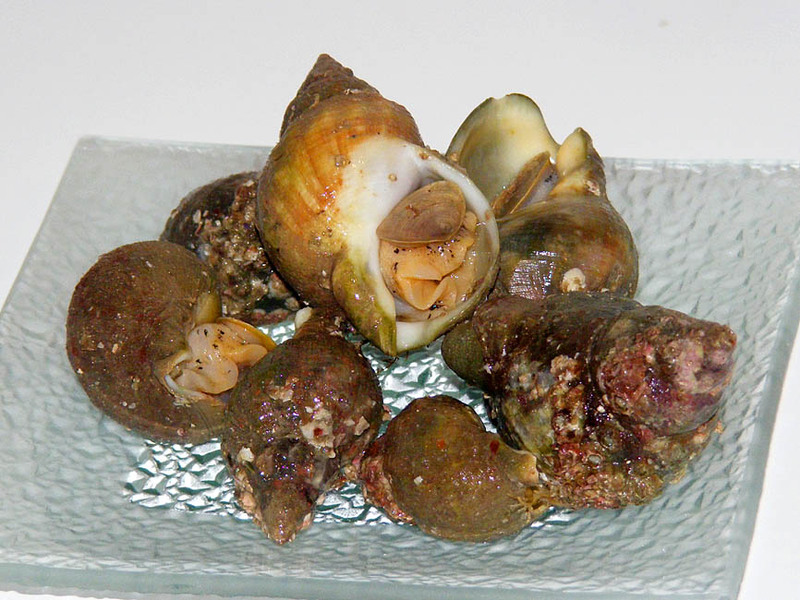 In France they are called bulots, in England they are whelks, and in Belgium, where they can be bought cooked in bouillon as street food, they are escargots de Bruxelles. In France they are most often served cold, and you can encounter them as one of the choices at lunchtime in restaurants that serve a buffet style entrée. Bulots from the fishmonger in Preuilly market. Like most seafood they must be cooked for a very short time or they turn into the most dreadful rubber. You also need to scrub them well before cooking to remove grit and growths that might fall off in the cooking. To eat them hook them out with a fork or toothpick, pop them in your mouth and bite off the hard 'foot'. At this time of year they seem to be producing roe at the other end, which is delicious - rather like liver in texture and flavour. These are different from little orange visitors. Do you live in France? Do you have a wood burning fire or stove? If so, you've probably spent the winter disposing of little red visitors on a daily basis. They are a beetle in the Cerambycidae family, known as longicorns in English and capricornes in French. If you live in France and you've had these beetles in your house you may be worried now that you know that they are capricornes. 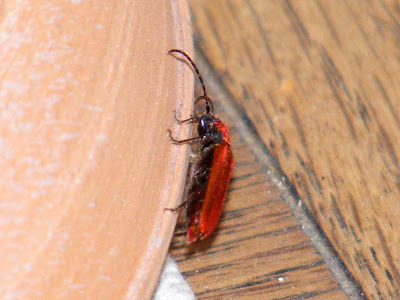 You get the impression that capricorne beetles can eat entire houses in a single night if you read some accounts. Worry not. Very few capricornes are in the least interested in your charpenterie, and those that are only like wood that is a bit damp (so your problem is not really the beetles, it's your roof and guttering). Many species of capricorne are in fact endangered because what they require is dead wood in a still living tree. They come in a wide variety of colours and sizes (there are many species). 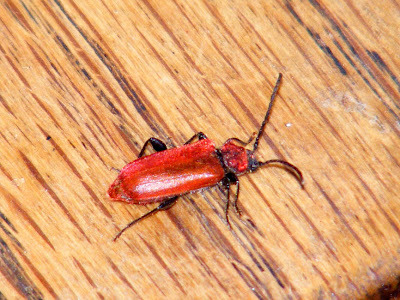 The red ones are most often Pyrrhidium sanguineum or Welsh Oak Longicorn Beetle. It doesn't seem to have a French name, which is curious, as it is quite common. They arrive in people's homes in the fire wood. Their natural emergence is scheduled for this time of year, but the warmth of their new homes causes the adults to emerge throughout the winter. Both because of their scarlet colour and their habit of heading for the net curtains (they are programmed to head for the light to escape) they are highly visible. Not only are they visible, but there is usually more than one, seemingly appearing from nowhere. 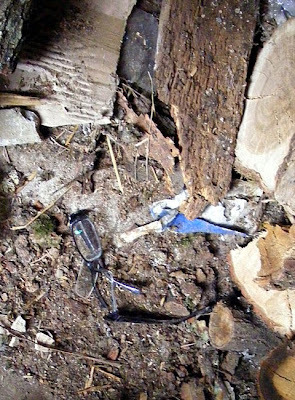 The homeowner begins to worry about the state of their woodwork, but there is no need. Oak Longicorns don't like milled timber, only rough oak with its bark still on. Looked at closely, for example through a 20x loop, they are extraordinarily beautiful. The red colouration is not created by the pigmentation in the wing cases, but is more like a red gold dusting of scales and hairs that can be rubbed off to reveal a glossy black beetle beneath. You can see a great close up photo taken by Dimitri Geystor on Le Monde des Insectes (the best French entomology online forum). The trout fishing season here opened at 6:35 (i.e. sunrise) just over two weeks ago. 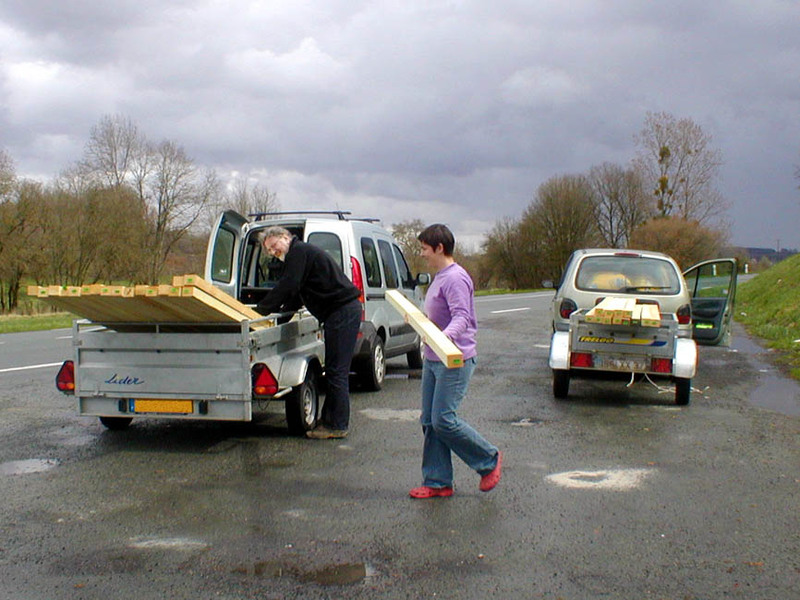 There are 15 000 card carrying anglers in the département of Indre et Loire, as well as holiday makers, day anglers and those who just buy a weekly licence. Although the Touraine isn't particularly known for its trout streams, traditionally, the opening of the trout season opens the angling season, so it is a much anticipated moment. In fact, the area is crisscrossed by a good many small watercourses which shelter populations of wild trout, which both reproduce naturally, as well as being augmented by fishery stock. In order to take the pressure off the wild population the Fédération de Pêche d'Indre-et-Loire releases 1500 kg of trout into the category 2 rivers. so I imagine they are farmed, not wild. Fishing licences (cartes de pêche) can be bought in tackle shops and post offices, and from this year, you can buy your licence online. 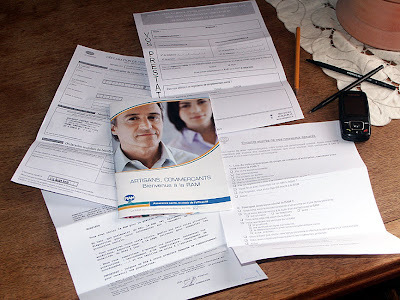 You need to supply a photo for the licence, and they are valid for the département only. To fish further afield you need to get an additional stamp on your licence. Rivers and lakes are categorised into Category 1 (those fast flowing rivers where trout and salmon thrive) and Category 2 (slower, warmer waters where coarse fish dominate). Landowners do not necessarily own the fishing rights to lakes and rivers on their property. Many of the best trout fishing rights are owned by local angling clubs (e.g. along the Aigronne), so in addition to having a fishing licence, you must also join an angling club. 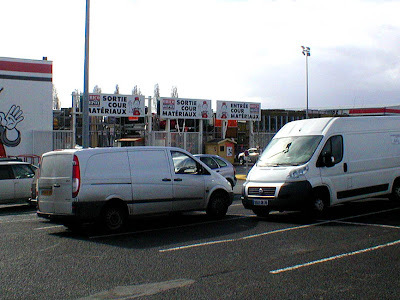 Fortunately, almost all the clubs have reciprocal agreements with each other, so joining one club means you can fish almost anywhere (certainly in Indre-et-Loire, and up and down the Loire Valley as a whole). Your licence will come with a leaflet that explains where you can fish. In category 1 rivers anglers are only allowed to fish on the weekend, Wednesdays and public holidays until 2 May. After that they are allowed to fish every day until 19 September. Category 2 rivers are open every day right from the beginning of the season. Anglers are allowed to take trout measuring at least 25cm long, and the catch is limited to 6 fish. Fishing after dark is not permitted. Of the rivers near us where you might catch a trout, the Aigronne, which flows through le Grand Pressigny, is a category 1 river. 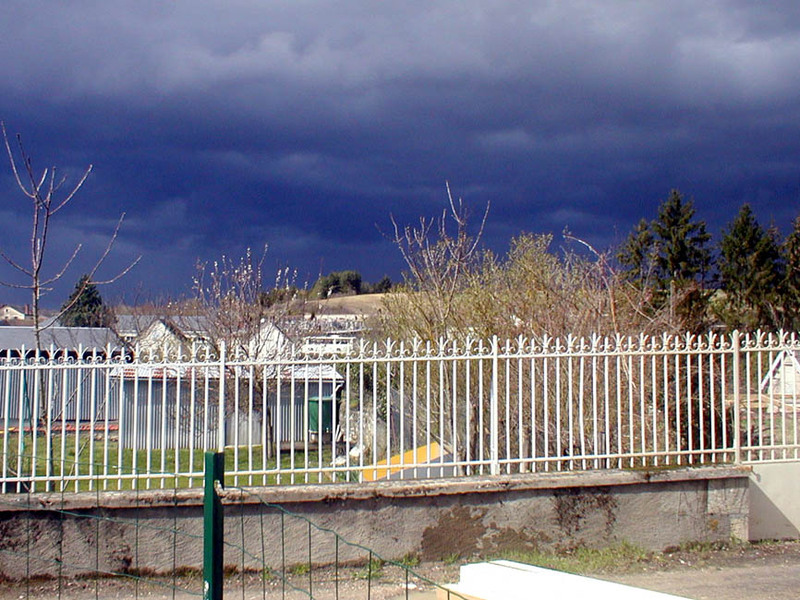 The Brignon (Betz-le-Château, Neuilly-le-Brignon) and the Echandon (Tauxigny) are category 2 rivers. 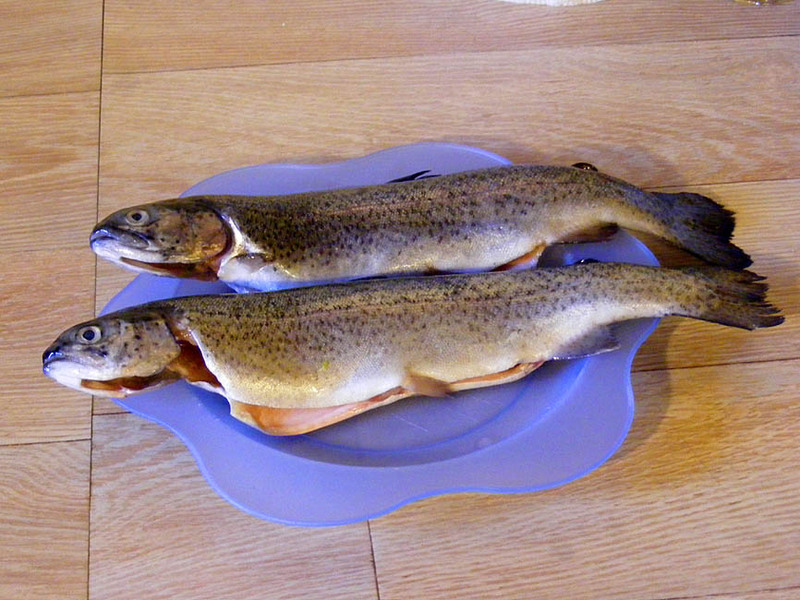 Anglers can also fish for trout, if they have a licence, on plans d'eau which are stocked in March and April. Note that I am not an angler and have never purchased a fishing licence in France. I cribbed most of this information from the local newspaper. Yesterday we bought the wood for framing out the guest bedroom and bathroom. This was more exciting than it should have been, for a number of reasons. Because we were buying so much materiaux, we took the trailer to BricoDepôt at Dissay. 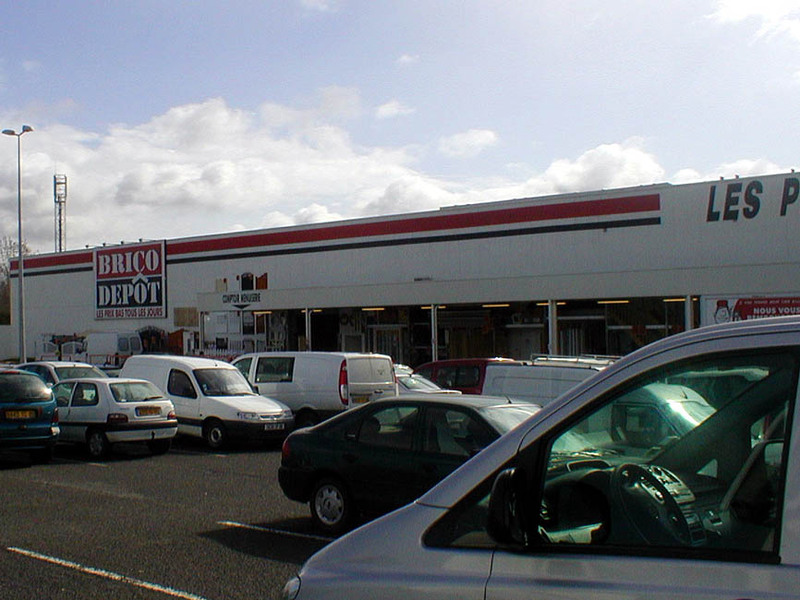 BricoDepôt is possibly the cheapest of the larger hardware shops, and is designed to be used by people who know what they are after - usually "spec-builders" (as we call them in Australia) - people who build homes speculatively to sell, i.e small scale professional builders. One of the features of BricoDepôt (and one we haven't tried before) is the drive through section for buying what is called "bati" - proper building stuff like lumber, bags of cement, insulation, bricks, cement mixers, scaffolding, and 1001 other big butch things. The idea is that you drive through, loading your car/van/trailer, and then pay at the end once you are done. We needed 30 pieces of wood, 3 metres long, and 63mm x 75mm profile. This we found without problem (it would be embarrassing to have to "do a blockie") and started loading the trailer. All of a sudden it seemed like an awful lot more wood than I had bargained for. Once we had paid for the wood and a couple of bags of insulation at the drive through cashiers we left for home. Immediately a problem became obvious. Because we had so much weight on the trailer, and because so much of that weight was behind the trailer's axle, at any speed greater than about 50kmh the trailer developed a "death wobble" which caused the car to fishtail. This is not a good thing at the best of times (am trying to figure out what those times could possibly be...) but on a rainy day on a road used by speeding semi-trailers it was positively scary. I pulled off to the side of the road and moved the load forward slightly, which improved matters, but not enough for us to progress much further. We pulled over to the side of the road again and started ringing people for help. Jill walked down to Stéphane's house to see if he could come and collect us (he wasn't in) and Nicole and Alex were busy and not answering their phone. Added to this, Susan's phone ran out of credit half way through a call, and we were feeling pretty low. Then Nicole rang back and said she would bring their big trailer. Just as Nicole said she would come and help, I noticed a tractor approaching at normal very slow agricultural machinery pace. I could tuck in behind him, then it wouldn't be me holding up the traffic - what a great wheeze! We rang Nicole and told her we were mobile at 45kmh. overtake when we had the opportunity. We followed the tractor to the outskirts of Châtellerault, and of course, once in town we were almost capable of the speed limit. We kept on driving (at one stage tucking in behind a cyclist as another excuse for not driving fast) until our path crossed with Nicole's. After trans-shipping a greater part of the load we proceeded home in convoy. Thanks to Nicole we had the wood undercover before a serious storm hit - if that had happened while we were sitting by the side of the road we would have been REALLY miserable. So there you go - an exciting day, but not one I would care to repeat. I have marked our epic drive here. If you're over six feet tall and lean sufficiently far out of our guest bedroom window, this is the view. 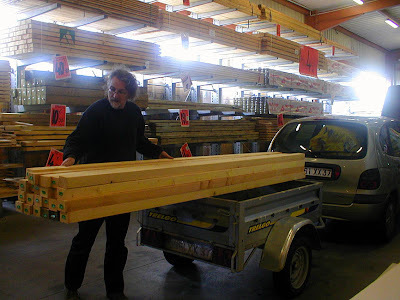 Today we are off to Dissay to buy the wood to build frame for lining the guest bedroom walls. The frame will hold 100mm of laine de verre (glass wool, or fibreglass) insulation and the gaine (conduit tube for the electricity) in place, and eventually be covered by placo (plasterboard). I made a discovery the other day: you really do have to finish cleaning up before winter comes. 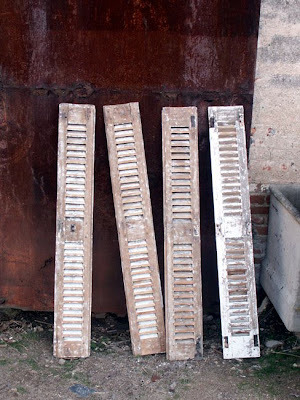 Last year I was painting shutters, and I was very disciplined (or so I thought) about cleaning my brushes. Every day I would clean them in white spirit, then wash them in soapy water, dry them, then leave them to air. 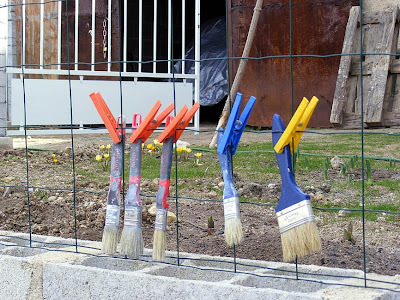 This meant that when I started painting the next day my brushes were in order. Imagine my surprise, then, when even before I started painting this year I discovered a jar full of white spirit with 3 paint brushes in it. I had obviously been distracted in about October, because they had been sitting there in the back of the garage gently soaking away all winter. Being frozen in white spirit does strange things to paint brushes - the residual paint was harder than the rubber handles. I have managed to clean them, and hanging them up in fresh air seems to have cured the sponginess of the rubber coating of the handle. They do still feel a bit odd, and I fear they will shed bristles hand over fist, but they are now clean. It is a lesson I hope to learn though - clean up before it startes snowing! Today Leon and Sue are paying us a visit (or maybe they are paying Célestine a visit and popping in to see us while they are in the area). We have met quite a few people through the blog, and shared some good meals and fun times. I don't know if that is what the interwebs were invented for or if it is the law of unintended consequences at work, but we rather enjoy it. At least, it is in the mind (?) 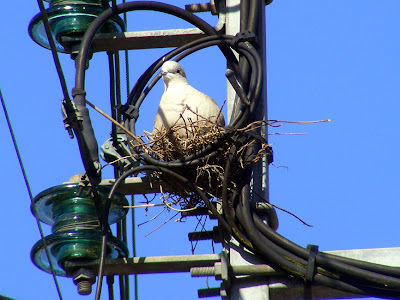 of this collared dove. 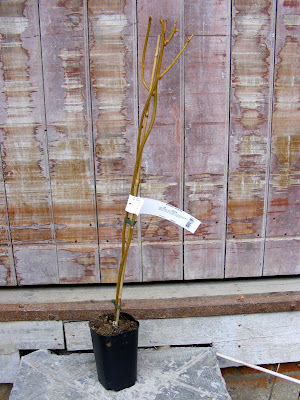 Yesterday we planted the kiwi vine against the grapevine trellis. As we arrived at the gate of the potager the first frog of the season jumped into the brook. The first cherry blossom has appeared on our trees, and the black redstarts are in a frenzy. As if any more proof is needed, yesterday afternoon the swallows arrived. This is two weeks earlier than last year, which is interesting but probably not a portent of anything. *this statement may be a little rash. A dove will never win Mastermind. 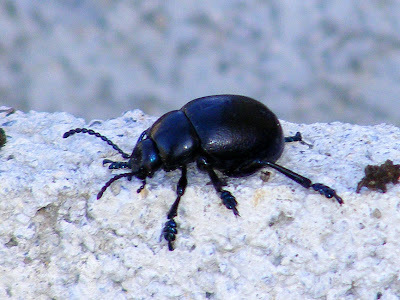 While I was gardening yesterday a black beetle lumbered purposefully along the retaining wall. 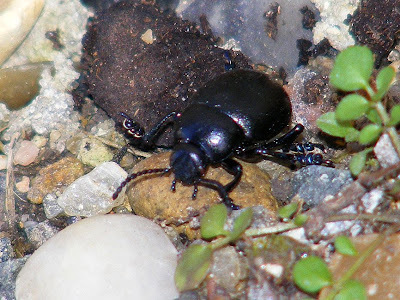 It was a male Lesser Bloody-nosed Beetle Timarcha goettingensis (called le petit crache-sang in French i.e. 'the little spit-blood'). Bloody-nosed beetles are so called because when alarmed they ooze a red substance from their mouth and kneecaps. They are amongst the largest in the leaf beetle family Chrysomelidae and have that family's typical smooth rounded profile. Bloody-nosed beetles cannot fly, and have a very distinctive rather ponderous gait, raising their bodies off the ground in a somewhat awkward looking way. This one was a beetle on a mission (presumably to meet a female beetle) and was too busy to be frightened by us encouraging him into more photographic positions. You can tell he is a male by his very large feet. Like many insects, male bloody-nosed beetles are smaller than females. 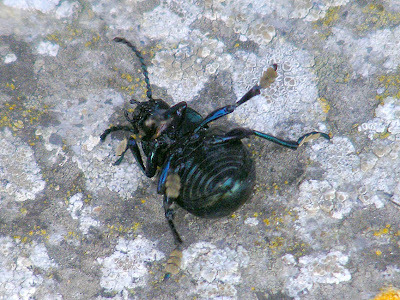 Both this species and the larger T. tenebricosa are common in France. On Saturday night Susan and I went out. This has always been quite a rare occurrance: when I was in a band I went out quite a lot but only to work, while Susan didn't - apparently going out 2 or 3 times a week to see the same band playing to a pub full of drunks isn't fun. When we moved to London I wasn't in a band, but we did live in maybe the only part of London not served by a night bus. This meant we had to make sure we caught the last train home at 20 minutes past midnight - something that always played on our minds and stopped us relaxing too much. We were beginning to think that living in the French countryside would mean that apart from the occasional town festival (here and here, for instance) our going out at night life was permanently over. Not so. Last weekend I was reading the newspaper (a rare occurance, we don't often buy a paper) and noticed an advert for a concert by Shanna Waterstown at the Bar Caravage in Loches. Neither are names I recognised but it said blues and jazz, so my attention was grabbed - especially as Loches is only 30 minutes away. The bar serves an extensive list of drinks, with a particularly impressive choice of non-alcoholic cocktails. Susan had an Explosif, which was raspberry, ginger, apricot and lemon juice, for just over 4€. All the cocktails were served in tall icecream soda glasses, with beautifully presented swizzle sticks made in house from bamboo skewers decorated with fine wedges of apple and orange and a chewy marshmallow on top. We were fascinated to see that almost everyone bought a drink at the beginning of the evening and nursed that same drink throughout the entire proceedings. It seemed the only people who had more than one drink were those drinking beer. The non-alcoholic cocktails were just as popular as the alcoholic ones. 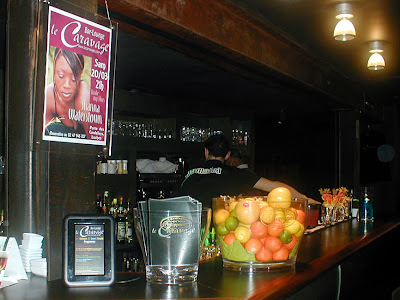 The concert was free and the bar makes its money through the sale of drinks, so the reasonable prices and the moderate habits of the clientele were even more surprising. It makes it a very pleasant and cheap night out. Shanna Waterstown is likewise great - an American living in Paris, with a rich mellow voice that she knows how to use to best advantage. She sang many classics, which the audience of about 50 people clearly knew and enjoyed, and a couple of her own compositions, which slipped seamlessly into the programme. 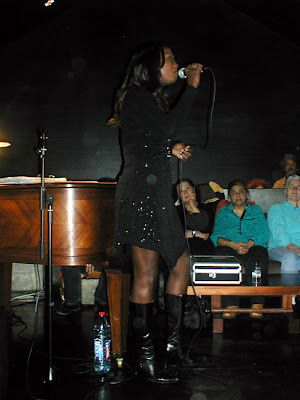 For this show she was accompanied by pianist Philippe Ours, but she will be performing at Paulmy on 5 June with her 8 piece band. We are planning to go and hope a few friends will join us. The venue is small - the audience of 50 was capacity - and we were only a couple of metres from the artistes. Some people were even closer than us, using the piano as a back rest. We were glad to have got there half an hour before the show started at 9pm, as late comers got progressively less comfortable seats. There was no problem about taking photos - Susan asked if she could, but as it turned out, everyone was doing it. The sound quality was good too - not too loud, not jarringly distorted as happens only too frequently. We will happily (nay, eagerly) go back whenever there is something that appeals on their calendar. Recently we were contacted by Pascal Maîtrejean, who told us about his father, Victor. This was in response to a request for information we posted 2 years ago. 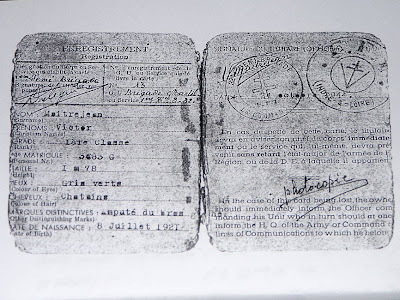 Victor Maîtrejean was born in 1921 in Algeria (then a French colony). At 14 years old he lost an arm in an accident on an airfield when he was turning a propeller by hand to start an aeroplane engine. 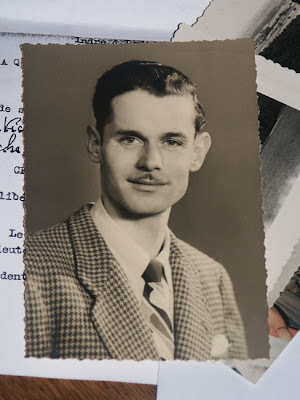 In 1940 he and his mother moved to central France, where he took up an apprentice gardener post at the Château de Pray between Amboise and Mosnes. they used to hide in. The only sound here now is birds calling. are the names of all the dead. 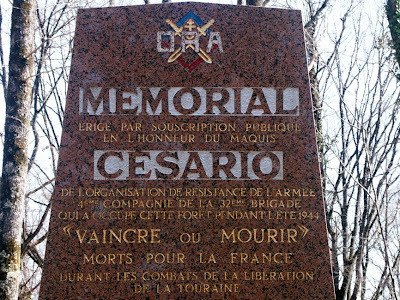 "On 24 June 1944*, being in the maquis FFI of Loches, commanded by Césario Bretegnier, we took up arms and left at 3 o'clock in a bus to patrol and ambush. 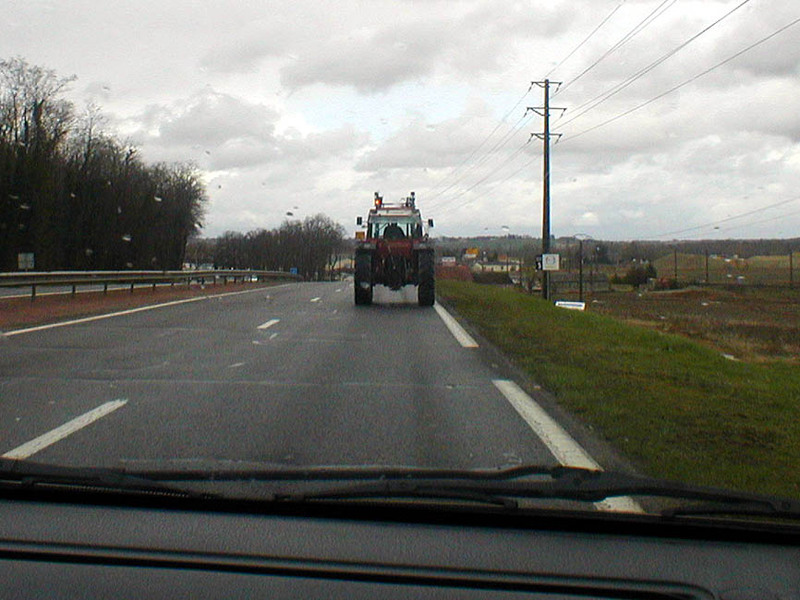 At 9:30 after having made around 30 kilometres, we came to an area called le Liege. We hid up and rested until 11:10, when we saw a German truck coming over the brow of a hill. As soon as they passed we attacked. The truck caught fire and we killed 13 German soldiers - a number that must have brought us bad luck, because we didn't know that behind this scout truck there was a company of Germans. The battle raged from 11:10 to 18:05 - 34 against 150 to 200. We killed 21 German soldiers and set two trucks on fire at the beginning, but it was too much and later, field upon field, vine after vine we retreated and lost 7 men killed and 5 others we know were captured and forced to dig their own grave then interred alive. By this time some of us were down to a single cartridge or grenade and we had lost our bus. 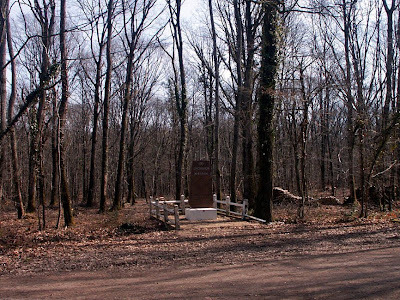 On the Loches road there is a memorial as you leave le Liege, for those who were buried alive, and another at Verneuil-sur-Indre to my companions who were killed or died after deportation. As a result of my participation in this battle I have been awarded the Order of the Army." L'original en français est ici. *His son thinks this may be a mistake and it should read aôut (August). Note from Simon: Victor passed away last year, which was when Pascal found the ID card and some associated paperwork. Vale, Victor. I think we would all like to think that we would have been as brave. Preuilly's eleven year olds are just back from a week long school camp in the Pyrenées. Our neighbour Tifaine and her best friend Théo (Valérie and Stéphane's eldest son) both went, as did Valérie, because she works at the school. Jessica, who lives on the market place and likes to greet me with 'hello' in English, also went. At the beginning of the school year, which in France is in September, the kids raised money to fund la classe de découverte (Discovery Class) by selling bulbs. 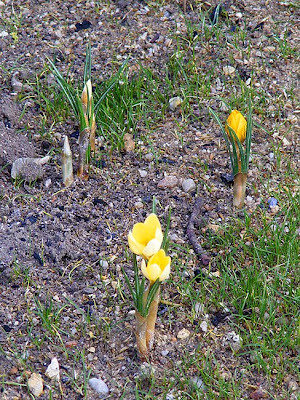 I bought crocuses and daffodils from Tifaine, and they are now coming up in the back garden. The crocuses are flowering but the daffs still have quite a way to go. I must remember to give her the stamp from the envelope for her collection. This week has seen many firsts for the year: Célestine's first wash, the first bumble bee, the first daffodils by the roadside, the first washing hung up outside. The most exciting first, by far, was the first yellow AGI Information Team shirt of the season. This means that the year has officially started and works can be done. The gates are now the same blue/grey colour the window shutters were painted last year. This helps it blend into the environment more - the black really stood out, although looking at the photo you may question the accuracy of that statement! 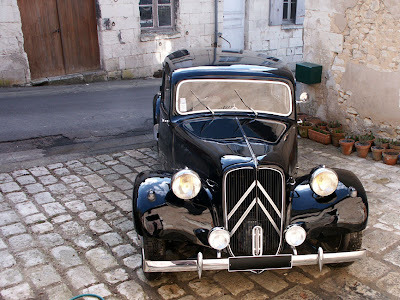 Monday was quite a pleasant day - the weather was good enough that I could wash Célestine without suffering frostbite. Tuesday was good too - even warm enough to do some painting. But yesterday, by comparison with what we had last week, was a scorcher. We started the day by going to Loches. 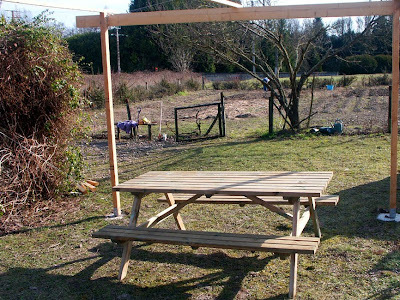 We decided we were going to buy a picnic bench from Mr Bricolage, and seeing as Mr Bricolage is next to a LeClerc Supermarket that has an optician, we would call in and see if we could do something about my reading glasses. Being Wednesday, it was also an opportunity to have a wander around the marché, which is one of our favorites. The lady at leClerc's opticians was really helpful, and found me some frames that my old lenses could be cut down to fit into. Even more pleasingly they were in the "second pair free" category, and although not fee to me (I wasn't buying a first pair) they were very cheap. We arranged to return at 18h to collect the frames with lenses fitted. When we got back in the car at 4.30pm the thermometer read 21°C. We both knew it was hot as we had been working in jeans and t-shirts, which is really nice after being all rugged up for so long, but 21°? Positively tropical, and over 20 degrees warmer than 10 days ago. If the temperature keeps increasing at that rate, August will be "interestingly" warm. We then drove back to Loches to pick up my new glasses, and called in to a new fruit and vege shop in Perusson to have a browse. We were both impressed with the quality of the produce, and the prices are about the same as supermarkets. What a pity we will be eating home grown only in future (touch wood). Yesterday we nominated the local general practitioner as our doctor. We've never met him and fortunately have had no need to go to the doctor since we have been here, so we hadn't got round registering with a medical practice. Even after presenting ourselves at the cabinet (surgery) yesterday and having him sign our form from RAM, which gets sent back to them with our details for our state medical insurance, we still haven't met him. Nor do we actually have our Cartes Vitales, the green plastic wallet card that allows one to reclaim a percentage of medical expenses. We've been waiting since November to get to this stage, after having registered the business and becoming regular taxpayers and therefore eligible for state medical cover. The covering letter from RAM says ' Vous avez choisi la RAM pour la gestion de vos prestations maladie'. Err...well, no we didn't choose RAM, RAM appear to have chosen us. We weren't even aware a choice was possible, since emailing RAM's senior partner RSI (Régime Social des Indépendants) has failed to produce any indication of where our file was at since November. I assume RAM stands for Régime d'Assurance Maladie, but nowhere on their correspondance or website can I find it written in full. Anyway, it appears that RAM are the agency responsible for the administration of the state health protection for trades people (artisans), business people and most independent professionals. We have met the doctor's receptionist before. She lodges with Monsieur and Madame Mériguet. There was no one in the waiting room and I expressed surprise. Given the average age in Preuilly I expected it to be packed. However, she explained that in the mornings the doctor does home visits and appointments to see him in the surgery can be made by telephone in the afternoon. The surgery is closed all day on Thursdays and Sundays, but open Saturday mornings. We had been somewhat unorthodox by doing what it said on the door (sonnez et entrez) - simply ringing the bell and walking in. Presumably this instruction applies to the afternoons only and they do not expect to be disturbed in the mornings. Luckily, the doctor was actually in his consulting room, and she took the forms in to him. He signed them and she brought them back out. Now we just have to fill out our part and post them back to RAM. The Cartes Vitales will apparently appear in time, and all we need do is keep any record of medical expenses, on which we can make a claim up to a year later. As a serial expat, I must say that health systems are mysterious things. The locals have all grown up with their respective systems, and such systems are deeply ingrained political entities. Although countries try to explain their systems, there is so much that is just understood and unspoken, an incomer is often hopelessly out of their depth. At least the French system hasn't reduced me to tears, which the British system did on several occasions. You would think something as basic as a health system would work more or less the same, but the devil is in the detail and negotiating a foreign health system, whether here or in the UK, is for me fraught with frustration and a certain sense of helplessness. Who does what and what they are called is just the beginning of it. The French system seems to be quite like the Australian system, albeit a bit more complicated, but neither the French or Australian system is anything like the British system. French bureaucracy is famously lumbering and longwinded. Although we have had our problems, at no stage have we felt that we were being deliberately given a poor service because we were not French. For every time an email sent to a government agency goes unanswered, there at least as many occasions when a polite and helpful civil servant has responded within 24 hours. Getting a Carte Vitale seems to be a real milestone for immigrants to France, and I can see why. It is an important part of making you feel at home and part of the system. It may still be a week until spring oficially arrives, but yesterday, for the first time this year, we had signs that winter will not last forever. This is a good thing, allowing me into the garden to do stuff. First stuff to do was play with my new powerwasher to find out what it will do. The good news is that it does an awful lot. I started by cleaning Célestine's rubber mat (quite good fun) and the trailer (also good fun) , then I decided to experiment. Out came the shutters I didn't finish sanding last year, and I had a blast at them most sucessfully, saving me about a week's work. 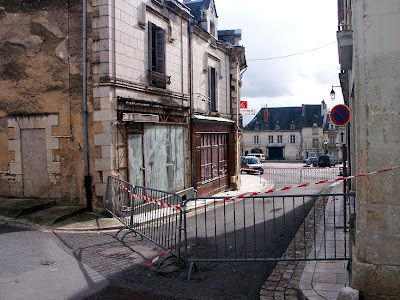 Then I started on the green slime that covered the walls of the old long drop (I'm not sure - or at least, unwilling to guess what caused that) and the stone steps at the back of the graineterie. After lunch Célestine had her first wash of the year. Her underneath was sprayed to remove salt and mud, then she was shampooed and chamoised dry. I wear (or rather should wear) reading glasses. They are only a recent thing for me, my first pair having been bought at the beginning of 2009. I didn't want to have to try get used to bi-focals, but neither my nose nor my arms long enough for me to be able to continue just using one pair of glasses. To be honest, I do find having two pairs of glasses a bit of a bind (as, I imagine, does anyone) but towards the end of last year I started to persevere with them and was getting better at remembering to use them. I didn't bother having them on a string around my neck because whatever I was doing they would dangle in the way, so if I though I was going to be using them they were put in a shirt pocket. Until the beginning of February, when they suddenly disappeared. We turned the house upside down looking for them, before deciding that they had probably worked their way into the recycling bag with some "pub" (advertising) and we had seen the last of them. On Saturday, Susan was getting some wood in, and lo and behold! They had obviously fallen out of my shirt pocket and been well and truly trampled into the dust and dirt on the garage floor. Not that they will work very well. 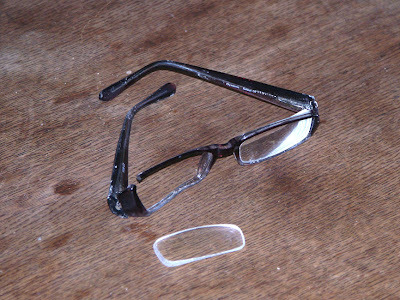 I hope I can go to the local optometrists and get a frame that will fit the (luckily) still intact lenses. The current frames are really cheap ones from Tescos, so getting a fit may be difficult. It could be cheaper to fly to London and buy another set of Tescos frames than buy here (which really is just plain wrong). On Another note: Our internet connect has been a bit weird that past day or so. I could get a Google search page and results of a search, but only about half of the pages would load - the computer would just sit there with a blank screen. Likewise, I could get our blog to show, but not Ken or Walt's. The Guardian newspaper would load, but Yahoo Mail wouldn't go past letting me put my password in. Statcounter, likewise, would load the front page really quickly, but Firefox would hang up when I tried to look at my stats. Our emails have been a bit odd, as well. We have 5 email accounts we check using Outlook (I know...). One but not both of the business email accounts would connect (and they are both on the same mail server) but each time I connected a different one would load. Of our London email accounts (also both on the same mail server) one or another (but not both) would download. Our French email account may (but then again may not) connect. This is also just plain wrong. And Frustrating. I just hope this loads and I haven't lost this typing! Since I wrote that last paragraph (about our internet connection) I have had a play (a long, frustrating play) with our computer and fixed it. The problem seems to be an update to AVG antivirus that caused conflicts with the firewall. I have since deleted AVG (temporarily leaving me with no antivirus) but my internet does now work. Question is, do I want the internet with no checking of viruses, or do I want virus checker and no internet, and no chance of catching a virus anyway. 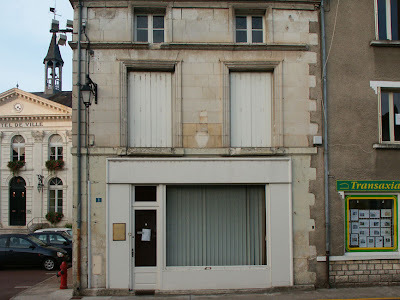 Anyone who lives in an old stone French house is undoubtedly living with scuties. 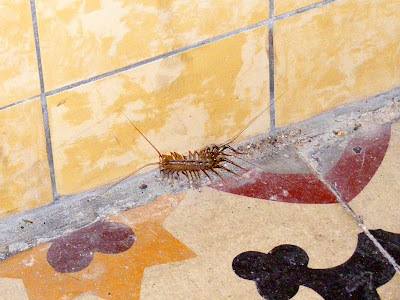 Or as they are more properly known, Scutigera coleptera, the Common House Centipede. They are fearsome looking beasts, with 15 pairs of very long banded legs and an even longer pair of antennae. 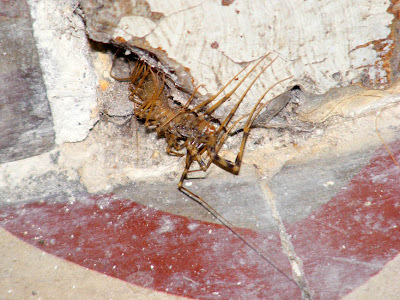 They live in the dark, humid crevices, coming out at night to hunt spiders, silverfish, cockroaches and fly larvae. They are venomous, with the first pair of legs modified into fangs. If they manage to bite you, it is painful and the flesh surrounding the wound swells and goes purple, like some spider bites do. Immature scuties have fewer legs, starting off with just 4 pairs. As they grow they moult their exoskeleton, and each time, they gain a few more pairs of legs until they are adult, after the fifth moult. They move very fast. The hindlegs are twice as long as the front legs, which allows them to cross over and beyond, preventing the scutie from ending up in a tangled ball of legs. 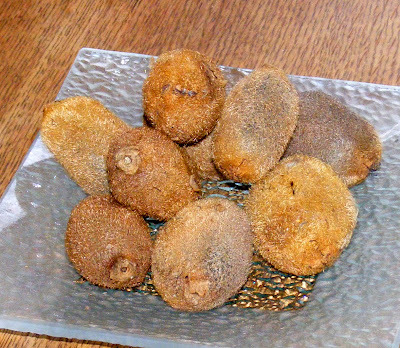 A few days ago, my friend Valérie gave me a dozen or so little kiwi fruits. They had been given to her by a farmer friend who grows them organically further to the south. They don't look much, but they are good. Kiwi fruit will grow in Preuilly (I've seen them in someone's garden, and there is a local producer who only sells kiwi fruit and asparagus on his stall in early spring), so I have bought a self fertile plant to run up the new trellis. From what I know about how rampant kiwi fruit plants are, it should compete more than adequately with the old red table grape vine that is also to be trained across the trellis (rather than 20m up the catalpa tree, which is useless). covered in brown fur just like the fruits. Unknown in France 30 years ago, today the kiwi fruit is a winter favourite in a season when not much good local fruit is available. From May to the end of the year, they are imported from the southern hemisphere, then the European crop takes over. A variety called Adour, grown in les Landes since the 1960s is registered as Label Rouge. 'Red Label' produce is high quality, organic and must be produced along strict traditional methods within a designated area. Kiwi fruit will continue to ripen after they are harvested, and can be kept in the fridge in a pierced box for up to 4 weeks. For the best flavour, take them out of the fridge and put them in the fruit bowl a few days before you want to eat them. They have few calories (47 kcal/100g) and a single fruit supplies your daily Vitamin C requirement. 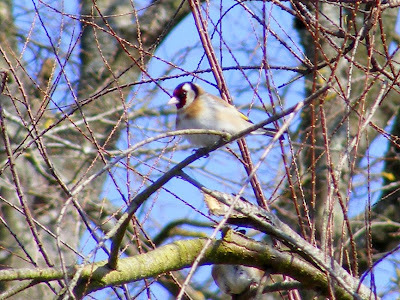 In French, the skin is described as duveteuse ('downy', pronounced 'doov-terz'). This protective layer means that they require very little in the way of chemical treatments to grow or for storage, even when not produced organically. Also, the skin protects the flesh from the oxygen in the air and stops the destruction of the Vitamin C in the flesh after harvest. Kiwi fruit contains an enzyme, actinidine, which breaks up proteins. It makes an excellent ingredient in a marinade for pork, or can be slipped inside a chicken to make the meat more moist. The fruit themselves don't survive cooking very well and are better eaten raw. They can be puréed to make a coulis, but it's better to do this in a hand operated food mill rather than in an electric food processor, because if the seeds get crushed they are a little bitter. Exceptionnellement, les personnes absentes lors de la 1ère distribution de sacs pubelles pourront venir le jeudi 11 mars de 8h30 à 12h00 à la Salle des Fêtes. Last chance! Those absent at the 1st distribution of bin bags can come on Thursday, 11 March from 8:30 to 12:00 at the Village Hall. In Preuilly we don't have to buy our rubbish sacks in the supermarket. They are distributed by the commune on behalf of the local waste collection company, SMICTOM. 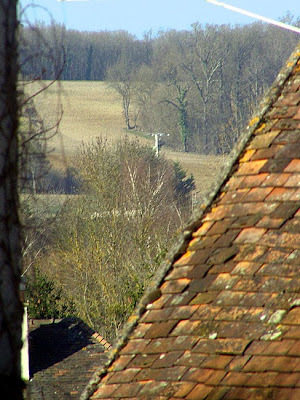 Our division of SMICTOM services the Sud Lochois, or the area around and to the south of Loches. Their head quarters are in Descartes, and their motto is au pays de Descartes, je pense donc je trie ('in the country of Descartes, I think, therefore I sort'). 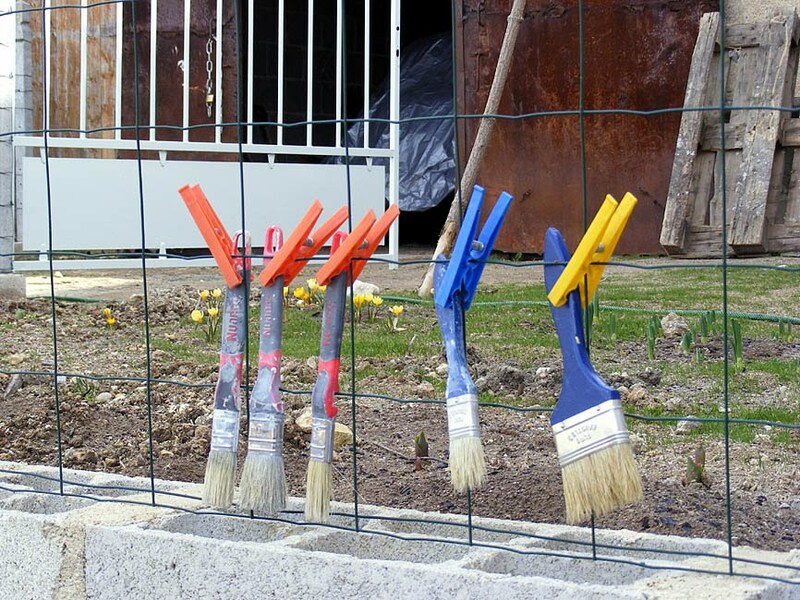 SMICTOM stands for Syndicat Mixte de Collecte et de Traitement des Ordures Ménagères (Joint Syndicate for the Collection and Treatment of Household Waste). Anything that has the Green Dot symbol to show that the manufacture is a member of a scheme to recover the packaging under the European Waste Management Directive should be put in the yellow sack, as should anything with the triangle of three arrows which is the international recyclable symbol. At the Salle des Fêtes the deputy mayor, Monsieur Thoreau, and Jean-Paul Charrier, one of the senior councillors, and a couple of assistants were handing out rubbish sacks. My name was ticked on the list of residents, the deputy mayor double checked that we lived here all year now and that there was just the two of us in the household. He asked me how I was (in English, to practice), to which my response (in French, to practice), was 'très froid', then he commented on my fingerless gloves and we all discussed items of clothing that we found particularly practical in the cold weather (les vêtements de chasse found favour with everyone as hard wearing, warm and practical, whether one hunted or not). Jean-Paul asked after Célestine. Collecting one's rubbish sacks is clearly one of the many communal networking opportunities. 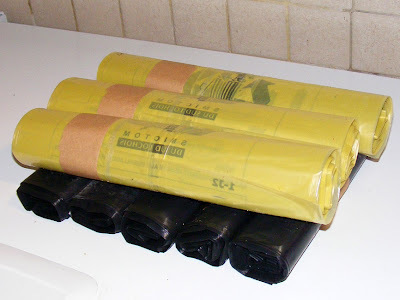 Our rubbish bag allocation is 5 rolls of black bags for general rubbish, and 3 rolls of sacs jaunes (yellow bags) for anything that can be recycled, except glass, which is too heavy to go in the bags and must be disposed of by the householder in the special bins placed in several locations around town. I think we've been given a total of 100 black bags and 60 recycling bags. French rubbish sacks have an integrated string for tying them up when full. It's a really clever design. A flat plastic thread runs down the length of the bags, perforated like the bags are so they can be separated for use. Each bag has its own piece of string, attached at the bottom, ready to be snapped off and tied round the top. Our rubbish is put out in the street on Wednesday night for collection at about 5am on Thursday morning. We don't put a bin out - the rubbish goes out just in its colour coded bags and sits on the corner of the driveway along with two of our neighbours' - an arrangement to save the garbage men time. We could have a wheelie bin if we wanted to, but there is no requirement to do so here, and the streets are so narrow they would be rather a hazard. Some people leave their rubbish bags on their front window sill, so the garbage man riding shotgun doesn't even have to get down from the truck to pick it up. It snowed lightly most of yesterday, somewhat to our surprise. It has been cold, not getting much above 0°C for the last few days, and it snowed quite heavily in the south of France a couple of days ago (very unusual for this time of year). 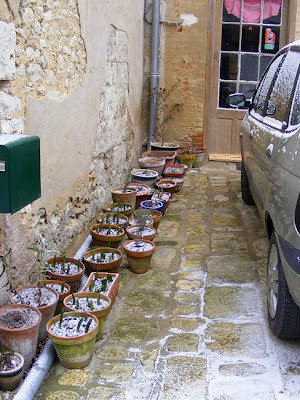 I've put the pots in their summer positions in the courtyard. The rose and the wake robin (Trillium erectum) in the corner will be completely untroubled by this snow, as they rest against the back of the permanently warm chimney. No snow settled on them at all. 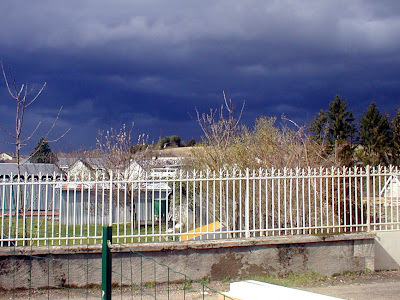 Apparently, according to our friend Stéphane, this is the longest winter since the early '80s in the Touraine. I assume he got this information from the news or something. It isn't the coldest winter though. Last winter had significantly lower temperatures, getting down to -17°C, but for a much shorter period. Our neighbour Edouard says that in 1956 the temperature remained below 0°C from the first to the 19th of February, and the winter wheat crop failed as a result. Perhaps not ideal for flourishing growth (below)? 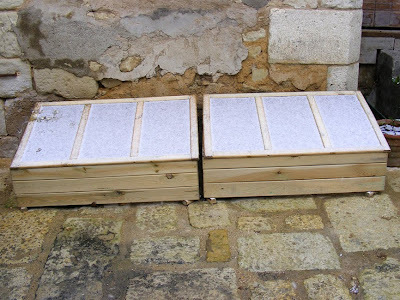 I made these coldframes from kits a couple of weeks ago, but I haven't sowed any vegetable seeds yet. Edouard says he has sown tomatoes, but his polytunnel isn't sufficient to keep them from freezing. At the moment I have a lot of seedling foxgloves and alpine pinks in the coldframes, protecting them from the wind rather than the frost, as they are completely frost hardy. Can We Have Spring Now? It has been a bit cool of late: yesterday, although the temperature got to a whole 4°C, the wind gave a it a real feel of about -5°C. This meant that I spent the whole day inside: all the little jobs I have to do are outside, and I am not quite ready to start the big jobs yet. The little jobs include finishing the bracing of the grape vine trellis in the orchard, digging a hole for the clothes line post, washing Célestine, pigeon proofing the ex-window above our front door, painting the garden gate, painting the storeroom shutter, sanding back the shutters for the bathroom window, and a dozen other things that need doing - outside. The grape vine trellis is only half stressed. 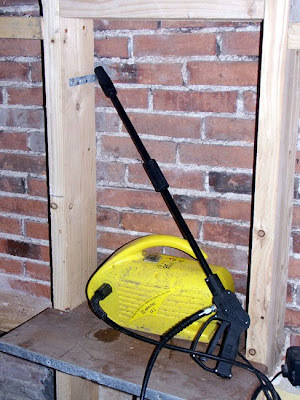 The big jobs are too numerous to list, but include putting framing and reinforcement for the single skin brick walls in the guest bedroom and bathroom, and sorting out both bathroom floors. You will notice that these are all inside jobs. All are jobs that are almost but not quite ready for me to start; we have Stéphane coming over this evening to have a look at the walls, and hopefully he will be helping me fix them sometime soon. He has restored houses before, has worked in the hardware industry, and is a furniture maker by training. This should make him very useful! damaged the buildings lining it. Until then I am still struggling with PHP scripts (let me assure you, if you don't know what they are, you really REALLY don't want to know) for the website, planning a publicity campaign for the business, and trying to chose a handbasin unit for the bathroom. And learning French whilst trying to stay warm. Edit: 15 minutes after this blog entry appeared it started to snow. I guess this means I will not be working outside again! 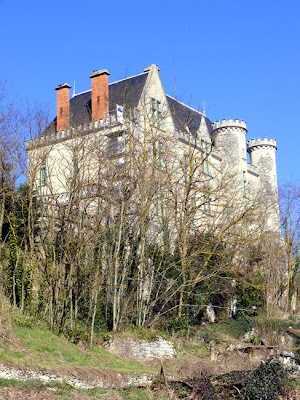 I wrote a couple of days ago about the château being scaffolded, but it wasn't until yesterday afternoon I wandered up the road to have a look. 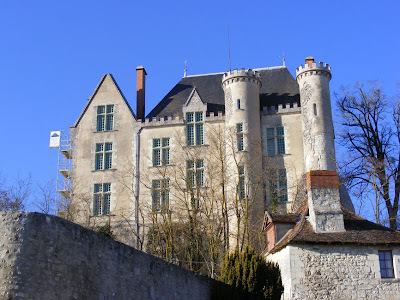 It is an impressively tall piece of scaffolding, but it doesn't wrap the château up nearly as much as I thought it would: in fact as scaffolding goes, it is pretty discreet. Not that you would get me up there, especially in the breeze we are currently experiencing. Although yesterday wasn't particularly windy, the wind was coming in from the north, where according to Bengt (who rang while I was visiting Jill and John), Sweden is suffering the worst winter for many years. He had just come in from shovelling 70cm of snow, and wasn't terribly impressed with me commenting how cold it was here. It was nice and sunny though, and if you were able to find a spot in the sun but out of the wind (not easy) it was a lovely day. 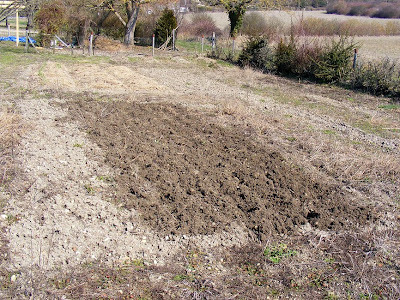 Yesterday being another fine but chilly day, I went down to dig the vegetable garden in preparation for planting potatoes. Edouard, our neighbour with the most impressive potager, tells me I should wait a fortnight (une quinzaine) before planting. 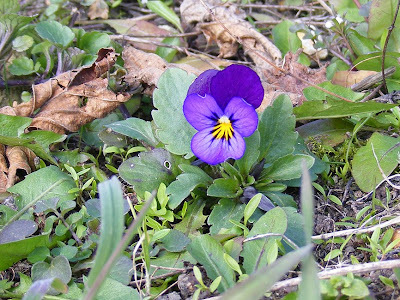 A viola, volunteering in the vegetable patch. and are the most gorgeous rich purple blue. I am not an experienced vegetable grower, but I've read a lot of the theory, and I am hoping this will be the first and last year I need to dig extensively. The soil is 50% clay and I have to wait until it is at just the right moisture level before I can dig. At the moment it is just dry enough to dig, but it will be easier after another couple of days for the wind to dry it out some more. At this time of year wind is far more effective than the sun at reducing the moisture content in the top few centimetres of soil. This year I will mulch heavily with old straw to add vegetable matter and keep the soil from developing a crust. one of many in the more densely twiggy trees. 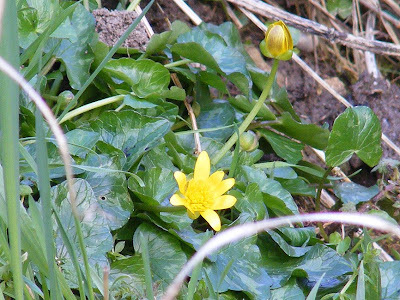 Although the wind was perishingly cold, from the north, there was considerable small bird activity and noise, and some brightly coloured early flowers. Some of the carrots have survived the winter and we ate them a couple of days ago, along with a baby cabbage that the big storm had knocked over. The dark patch of soil is the result of about an hour's digging. PS Those of you interested in botany might like to take a look at Loire Valley Nature, where I now have a useful section on wild orchids, with a complete species list for the area and a page for each of the species you are likely to see without too much expertise or experience required. I've included lots of tips for correctly identifying any orchids you see, and lots of photos. In time I will add more photos and map references. Last night we had our friends and neighbours Sylvie and Pierre-Yves over for dinner. I am writing this before they arrived, so I can't actually report on the proceedings, but I can tell you what the menu is. I am making snacks to go with a pre-dinner glass of sparkling rosé from the Simoneau vineyard near Saint-Georges-sur-Cher. We are having some of our homegrown hazelnuts and walnuts, lightly toasted in the oven, and slices of hardboiled egg on crackers, dressed with Swedish caviar paste or aioli. Then there will be crême de choufleur au bleu (cream of cauliflower soup with blue cheese - in this case bleu d'Auvergne), followed by roast leg of lamb with Cumberland sauce, and steamed potatoes and peas and accompagnied by a 2003 cabernet franc from Chinon. Dessert is Persian Love Cake, served with a dollop of homemade cherry topping. who calls at the house. The cheese course, in between the lamb and the dessert, is pavé de Betz, from Betz le Château, (the town name is pronounced by some locals as "Be'l'château") only a few kilometres away. Pavé de Betz is so called because it is the size and shape of a small paving tile, or paver. 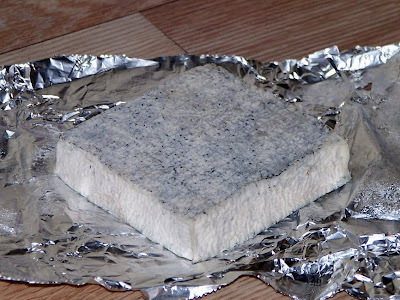 It is a soft goat cheese, with quite an assertive flavour. How creamy it is depends on the season, and it takes 1.4 litres of milk to make a 170g cheese. Yesterday was a bright clear day, with quite strong sunshine which felt warm if you were out in it. The temperature was below 10°C, but all the same, there was little breeze and it felt warm in the sun. 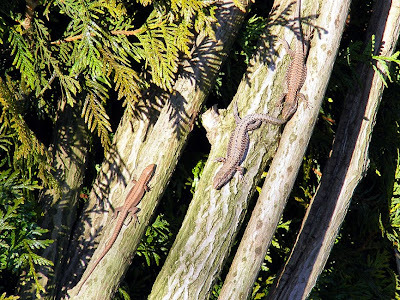 The lizard family at the orchard were certainly taking advantage of it. 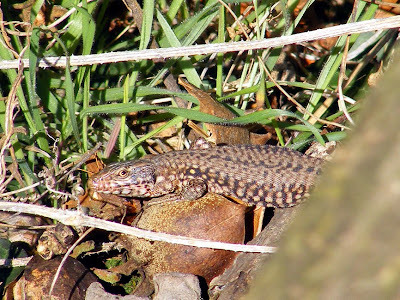 We watched about 8 Common Wall Lizards Podarcis muralis (le lézard des murailles in French). As is to be expected for early spring, they were quite frisky. We witnessed some athletic leaping from log to branch, a fight between two males and plenty of submissive arm waving by females and juveniles. From left to right, a juvenile, an adult male and an adult female. 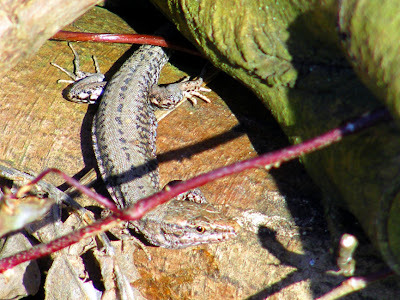 Common Wall Lizards vary quite a bit in markings and colour, but in this family, females seem to be a reddish brown with dark brown and cream spots; whilst males are greyer, with fewer spots, but including a row of bright blue spots along each side. Les Grues sont arrivées !